This famous tango couple barely needs an introduction! We are so delighted to host them in Washington DC for the first time ever. Do not miss their spectacular workshops and performance. Roxana had already listened to Tango music in her mother’s womb. As a young child, she used to go with her to the milonga her grand mother Martita organised in the Congresso district in Buenos Aires. She grew up immersed in Tango, watching the best dancers of the time and learning from famous maestros. 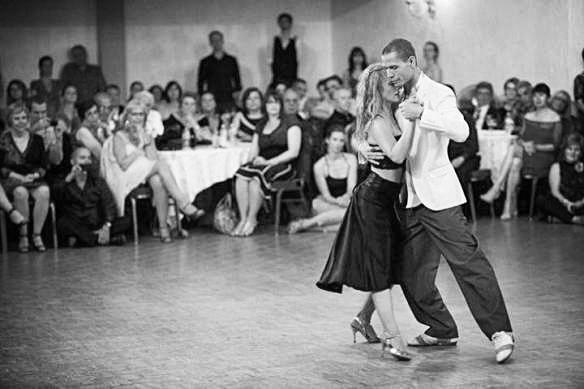 Sebastian discovered Tango when he was 15, after a friend made him join a Tango club. At that moment, without even realising it, he was at a turning point in his life. In 2005, he decided to take part in the Tango World Championship with Ximena Gallichio and they became World Champions. Sebastian and Roxana united their careers in February 2007. Since then they have taught together and have danced in the most famous milongas porteñas and have taken part in Tango festivals worldwide (Americas, Europe and Oceania). We will do our best to keep these workshops role balanced. You don't have to register with a partner, but you are welcome to come as a couple and stay out of the rotation. Registration is limited to 50 people on a first-come first-served basis. LEADER’S WEEKEND SPOTS SOLD OUT. Milonga Admission not included in the Workshop pass, please pay at the door. Gabriel, also known as El huracan, is a passionate, intuitive and energetic dancer who stands out on the dance floor thanks to his boundless creativity and versatility. In 2010 he decided to focus solely on Tango and has since been invited regularly to perform and teach throughout North America where he plants his love and enthusiasm for the dance. His students expand their technical knowledge and a strong connection through his generous, clear, precise and captivating teaching method. Always desirous to evolve in Tango, Gabriel constantly perfects his dance. Marcelo El Chino Gutierrez: 3 month residency with Tango Mercurio! We are thrilled to announce that the extraordinary Marcelo El Chino Gutierrez will be doing a 3 month residency with Tango Mercurio for the Spring 2018 Session. El Chino is regularly sought out to teach workshops of his system to groups of professional tango dancers around the world; and is also well known for his ongoing Cobra (teaching women to lead in tango) classes in Buenos Aires. To found out which classes Marcelo will be co-teaching this Session, take a look at our Class Schedule page for a full breakdown. John Hernan Raigoza & Yaisuri Salamanca are an award-winning professional Argentine tango couple with more than 15 years of experience. They won third place in the tango stage category at the 2008 Tango World Championship, in Buenos Aires, Argentina. Their combined experience includes Arrabal Tango Musical, 37 theaters from the United Kingdom and West End of London, and the most prestigious tango houses and Milongas from Buenos Aires. In the USA, they have taught across the West and East coast. Currently, Yaisuri and John Hernan are touring around the world. Tango Mercurio's founder, Sharna Fabiano, is back in DC with a brand new program, a provocative (somewhat serious, but not too serious) exploration of the tango mind and body. We invest a lot of our time into the technical, musical, and connective aspects of our dancing, but our inner dialogues, and our diverse ways of seeing the world and ourselves, also influence our ability to connect skillfullly and to dance at our full potential. We use these terms all the time, but how do they actually help us to embody the tango? How might they be getting in our way? What’s the difference between being a “supportive” vs an “obedient” follower? Between a “clear” vs a “controlling” leader? And how can we use these subtle but important differences to guide ourselves more effectively toward sophisticated, creative conversations on (and potentially off) the dance floor? On Saturday, you’ll refine your skills in your less familiar role (leading for women and following for men) within tango’s classic vocabulary of crosses, turns and ochos. You'll receive detailed individual feedback, and participate in a frank and honest discussion of social dancing with members of your own gender. On Sunday, you’ll return to your familiar role to explore specific strategies for elevating creative dialogue. Work with more advanced vocabulary such as boleos, sacadas, and paradas, and learn how to shift musical interpretation, quality of movement, and navigation in conversation with a partner. You'll also participate in a guided discussion of tango community. Participation is limited to 10 men and 10 women (must attend both days). Intermediate experience in one role is required. Prior training in your secondary or less-familiar role is recommended but not necessary. Note to women: bring flat or low-heeled shoes. We are happy to welcome Korey Ireland back to Washington DC! A former DC resident, Korey has a deep connection to our community and is always eager to share his knowledge of music and tango. Korey is a professional composer turned tango-addict. He brings a lifetime of musical experience and an unquenchable thirst for tango to his teaching. Currently based in Berlin, Germany, Korey has spent the better part of the last 15 years traveling and teaching tango in the U.S., England, Holland, Spain, Germany, Russia, Kenya, Poland and Argentina, sharing his passion for tango, music, expression, and connection. In recent years, this mission has grown to include work with aspiring tango musicians at festivalthroughout North America and Europe to create live music for dancers. In 2009 he led the “Monster Orchestra” of Tango de los Muertos resulting in a live CD of his arrangements and transcriptions. This project led to the birth of the Community Tango Orchestra project, which in its 6th year now includes about a dozen ensembles throughout the US and Europe dedicated to nurturing the tradition of golden age tango for dancers and musicians. LECTURE on "Literal versus Selective Interpretations of Pugliese". 2 PM - 3:30 PM - Walking Games: working with connection and musicality, in tango’s most fundamental aspect. 3:30 PM - 5 PM - Tango Rhythm under the microscope and though the looking glass - a detailed examination of how tango dancers interact with the rhythmic resources of tango music. 2 PM - 5 PM- "Secret Passages and Hidden Spaces” uncovering beautiful and underutilized possibilities in familiar movements. Location and pricing: $150 for a weekend pass. $130 for full-time students with ID. Everything will take place at: North West Sport and Health, 4001 Brandywine St NW, Washington, DC 20016. Alex has been influenced by many people and styles, but influenced early on by Mariano "Chicho" Frumboli(musicality), Fabian Salas (structure of the dance), and Damian Esell and Nancy Louzan (posture, walk, elegance). Studied and danced in Buenos Aires for over six months between seven visits. Co-taught and performed with Luciana Valle (BsAs) in Denver, Austin, San Francisco, Boulder, North Carolina, Aspen, London (UK), Bylaugh (UK), Bristol (UK) and has performed with Luciana in Buenos Aires (Torquato Tasso and Centro Cultural Mora), San Francisco, Portland, and Seattle (at the Benaroya Theater with the New York Tango Trio). Alex has co-taught with Florencia Taccetti (BsAs) in Minneapolis, San Francisco, Albuquerque and Pittsburgh and has performed with her in Minneapolis, Portland, Albuquerque, Pittsburgh and San Francisco and performed in London (with Biljana Lipic), Amsterdam (with Yvonne Meissner), Antwerpen (with Esther Heitzer), Florence (w/Yvonne Meissner), Munich and Augsburg (Germany, with Heidrun Fluk). Has been invited to teach in Beijing, Moscow, Cape Town, Frankfurt, Aachen, Cleveland, New Zealand, and Antwerpen (Belgium). Has DJ'ed milongas in Portland, Anchorage, Dallas, Ann Arbor, Augsburg (Germany), Cambridge (UK), Seatle, Victoria (B.C. ), Salt Lake City, Boulder, Denver, St. Louis, Minneapolis, and the all-night milongas in San Francisco, Washington DC and New York City. Tango Mercurio is thrilled to host Eric Lindgren in DC this Spring! Eric is a world-renowned teacher and a superb dancer, who brings with him a deep knowledge of tango technique as well as clear and precise language to describe movement, dynamics and musicality. Eric fell in love with Tango in his first class. A month later he had moved to Buenos Aires to pursue the dance full time. In the decade since he has continued to explore the many unique avenues of style, technique, and self-expression that Argentine Tango offers. Enjoy one of Eric's latest performances here. Simple secrets for luscious movement and cozy connection. Expand you Close Embrace comfort zone! In this class, we’ll cover a challenging five-part close embrace sequence. Playing with texture and rhythm, this sequence is sure to entice and challenge both partners. Finding technical precision, excellence, and pleasure through powerful, expressive following and present, clear leading. Working torsion and pivots into our milonga without losing our cool. This class is a drop in, no prior registration required. Murat is gifted with an insightful, thorough and analytical understanding of the dance. He started his journey with tango in Istanbul, 1997. Widely known for his strong lead and musicality, Murat's background in fine arts and music provides him with the perfect blend of senses for the movement of bodies through time and space. In his philosophy of teaching Murat strives to offer students valuable tools in order to enable them to take control of their own personal growth. He is warm, attentive, entertaining and accessible to students. The style of his teaching is holistic in approach and clear in method. He successfully combines technical and sensory exercises with fundamental concepts that lead to all the challenging possibilities of improvisation and expression. As demonstrated in his own dance, he focuses on the origin of movement coming from an agreement in the embrace and has created a unique brand all his own characterized by musicality, playfulness, a balanced partnership and an awareness of social etiquette. Murat has influenced large numbers of dancers with his unique perspective of dance and instruction. He followed his parents path to art school. He established himself as an artist before he arrived in the US to complete his Masters Degree in Painting. His art works were sold to collections in Europe and in the States. For quite some years, Murat used to call Washington, DC home, and there are many people around who originally learned from him. In 2015 Murat has given his world-famous tango talk on musicality at Stroga and we are delighted to have him back once again, this time for a tango workshop. If you don't know him yet, he is not to be missed! Below you can see one of Murat's latest performances with Sigrid Van Tilbeurgh at Palazzo del Toscano, Catania Italy. April 2016. "Silencio" by Oswaldo Bercas was originally suggested and provided by Yves-Pierre Senn which to this day, it was never released in digital media and on internet. For that reason, audience applauses during the performance have been removed for providing a clean audio with the intensions of contributing a new tango to the community of music lovers. Please note that all participants MUST register for this class. The space is limited and the spots will go fast! Class packages and monthly memberships can NOT be used for this class. Click the button below to reserve your spot.